learned acrobatics in Indonesia. She spent seven years in a Japanese monastery perfecting her sword technique. She even traveled to the American West. When Selim relays what Delilah told him to his commander, his commander doesn't believe that a woman could do all that. (This book takes place in a sexist time period.) Then, just to make things worse, Delilah escapes. The commander assumes that Selim let her escape and sentences him to death. Just before Selim is beheaded, Delilah saves him. They escape the city in her flying dingy. The rest of the book tells of all the adventures that they go on. The artwork in this book is beautiful, especially the landscapes. There is a scene where Delilah and Selim are climbing an aqueduct. The aqueduct doesn't look real, but it looks very, very beautiful. Delilah is also very beautiful. She has a humongous ponytail with a tie at the top and a tie at the bottom. Her face is always so expressive. A scene I like is when Delilah first gets Selim into the flying boat. Selim's expression is one of pure shock. Then there's Delilah, who just looks so pleased with herself. I really like this scene because of the character's expressions. The artist captures what's going on in every characters head perfectly. I know what each character is thinking from just the looks on their faces. This book is perfectly appropriate for anyone who doesn't mind mild violence and sword fighting. It's pretty funny. I love the character of Selim. I really love the character of Delilah. But most of all, I love how Selim and Delilah are complete polar opposites, but they still get along really well. 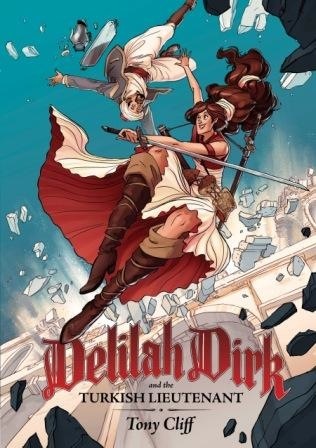 I would give Delilah Dirk and the Turkish Lieutenant 4 flying boats out of 5. You're a renaissance man, man! Great writing. Makes me wish they had these cyber blogs way back in the day when was laying around with my Beatle magazines. Keep up the great work, Milo. "This book takes place in a sexist time period." "This book is perfectly appropriate for anyone who doesn't mind mild violence and sword fighting." I seriously love the way you can turn a phrase. Your drollery and deadpan delivery are my favorite things about your writing. For what it's worth, I love mild violence and sword fighting. Great review. I loved this book, too. Selim and Delilah are a great pair. How old is Delilah? She has done an awful lot in her life. Does she make a living stealing documents and handing them over for money? As you can see, I'm intrigued. I always like a review that makes me want to read the book. she looks young, but theres no exact age in the book. 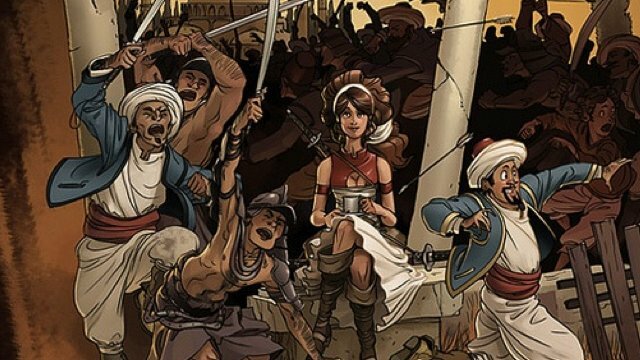 I love that the time and place is early 19th century Turkey, and the heroine is a strangely worldly (for the time) young woman with ninja-like skills. Great review, Milo! Makes me want to read the book! Ben Kotis: I enjoyed your review, it is filled with great detail and is a well packaged summary of the novel. I like how you incorporated illustrations, and text from the graphic novel, it is a perfect compliment of your written review, and gives the viewers two perspectives. Maybe as a fun activity, you can gather a picture from the book online, turn your computer brightness on full power and trace the illustration, I used that in history class when we were assigned to draw a picture of the civil rights movement. All in all I thought it was an excellent opinion article about this novel and hope to hear more. You are such a good writer. I have not read a graphic novel since Persepolis but now you have inspired me to read another one. And I love the way you notice the facial expressiveness of the characters. Thanks so much.